Not sure how many Curlew Sandpipers make a fling, but we did see six together one day. Initially we struggled to identify the few we were seeing as they were all mixed up with Plovers and Dunlins. The Grey Plover and Turnstone maybe easy to identify but Dunlins and the Curlew Sandpiper look similar, and is that a Sandpiper by the Turnstone or something else?! 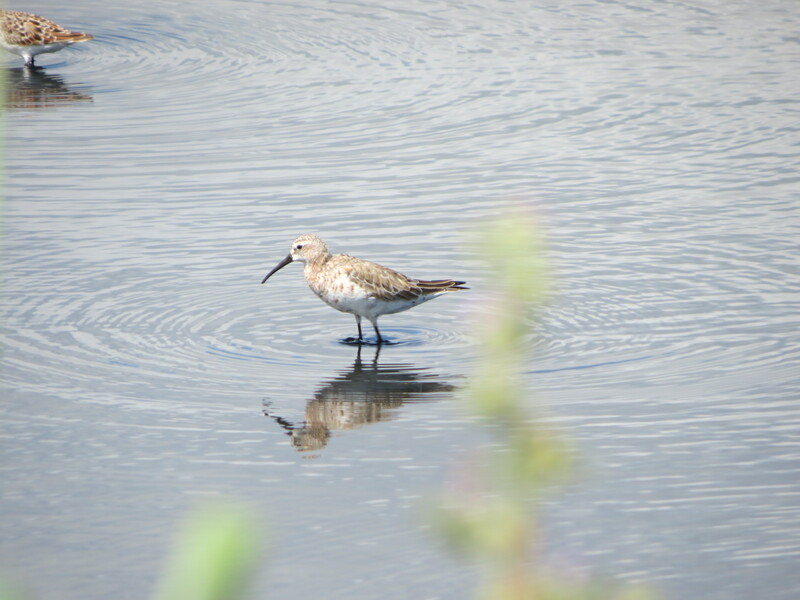 Curlew Sandpipers are very similar to Dunlins, they have though a longer, more down-curved bill than the Dunlin and because of their longer legs will feed in slightly deeper water. On the days we were going out of course they were all in the same bit of water! 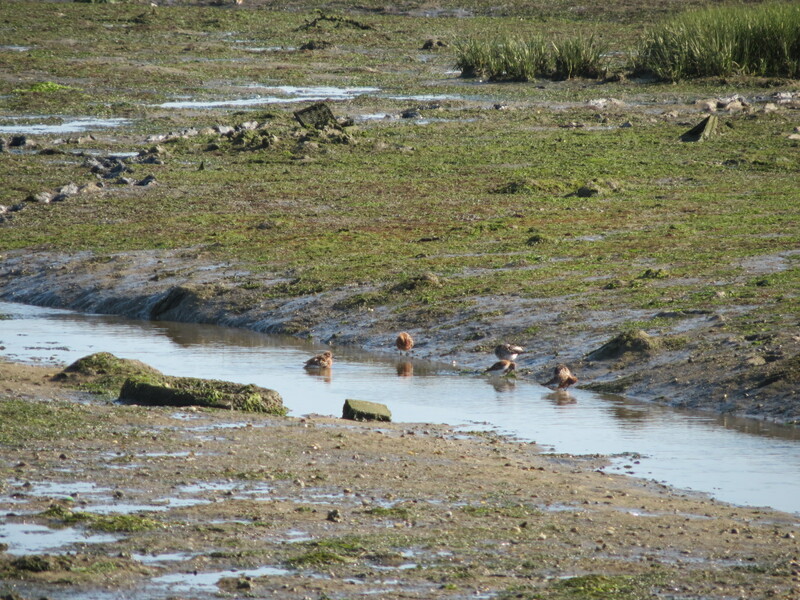 Apologies for the bit of greenery, but if we had moved it or us the Curlew Sandpiper would have gone! The RSPB advise that their deep chestnut breeding plumage is unmistakable in spring and summer but when we were watching them in late March/early April they were only just coming into their summer plumage. The excellent British Trust for Ornithology admit it can be difficult to distinguish between the two, but go on to say that once you have got your eye in you’ll be fine as the Curlew Sandpipers appear more elegant than Dunlin with a more upright stance, due to their longer legs and more elongated neck. Well that may be the case but I’m not sure I’ll ever be really confident about what I am looking at even in summer when they have their gorgeous chestnut chests! Fortunately however my husband is far more persistent, focused and determined than me when it comes to identifying waders and after a few days he had got his eye in and was confidently spotting them. 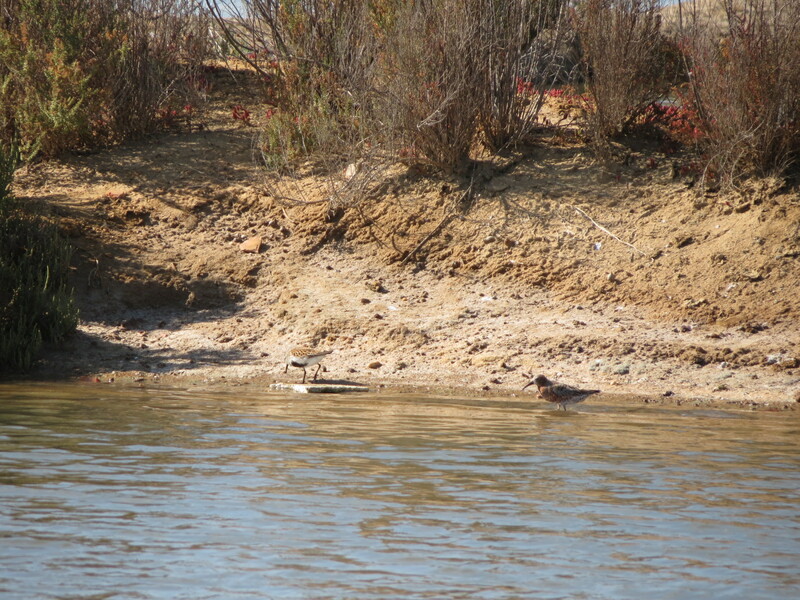 Curlew Sandpipers are called Pilrito-de-bico-comprido in Portugal and the ones we saw in the Ria Formosa in April were en route from Africa to the Arctic to breed. It is an unusual route for them to travel via Portugal when heading north which is why we only saw them in small numbers. They do however come back via Portugal when heading south for the winter. The fascinating titbit I learnt when preparing this post is that Curlew Sandpiper numbers are dependent on lemmings! When lemming numbers are low, then Curlew Sandpipers have less success with breeding because Arctic Foxes will change their diet to include the sandpiper chicks to make up for the lack of lemmings. Portugal is such a beautiful country, we are so lucky to be able to visit again and again. This is a beautiful post. Now I know Curlew Sandpipers. And also what a fling is. Apologies are accepted for the photo with greenery, no, actually it’s a beautiful photo. No need to apologize as it’s hard to capture. Have you seen a film Lemming? It’s a french film I suppose maybe Norwegian. I don’t remember well. Your post brought its memories back. It’s a very intriguing film. Thank you so much Anand, and no I haven’t and I’m intrigued now. Just googled and the one that is coming up is a 2005 psychological thriller . .is that the one? I’ll certainly try . .thanks for the recommendation.